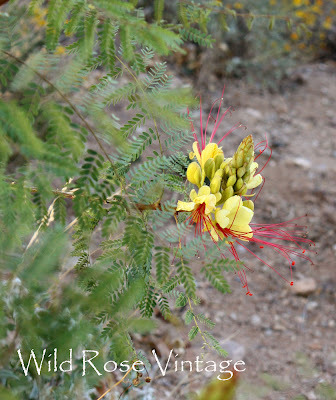 One thing about Arizonans, they are up and out by the crack of dawn! There is a flea market the first Sunday of every month. This was my 3rd time and I finally got it right (even though they advertise that it starts at 9 am I discovered people start shopping at sunrise). I got up at 5am, left the house a little after 5:30, arrived and was able to park in the shade just shortly after 6am. Maybe next winter I'll have more of these treasures I keep bringing home arranged and looking pretty. I'm mainly working on the bedroom and the living room now. The kitchen will be the main project next winter. It's going to take at least two, maybe three more winters to make it feel like home plus I have to paint the outside of the house too! 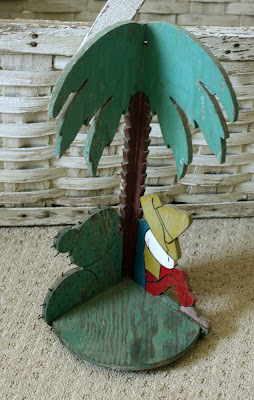 Anyway...here are more of the 'goodies' I keep bringing home to decorate. I was seriously planning to buy a reproduction Paul DeLongpre print and have it framed to hang over the head board of the bed. I found a vintage print in a vintage frame and in excellent condition $15! 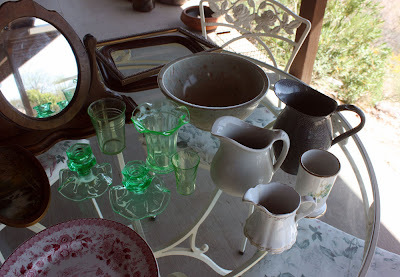 My stash of treasures, everything here was really cheap, about $10 on down to $1...the oval mirror on the stand is already in my closet on the chest of drawers. I have a place for the transferware plate ($3) once I get a plate holder and the little oval picture of birch trees has already found a home. 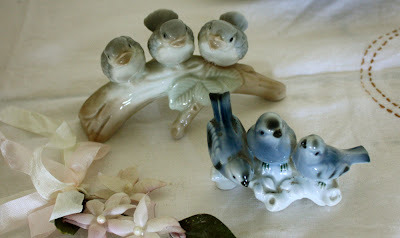 I collect vaseline glass and I was lucky to find a few more pieces at a very good price. The vendors are so willing to knock off a few dollars. The Texas Ware bowl I'll use in the kitchen, a few pitchers that can always find a place to rest and a couple of old frames. While I was taking pictures I thought I may as well show you the 2 sets I purchased a few weeks ago at an antique mall. I wanted an outdoor couch for this giant front porch, 16' x 56', the rest of the porch that you don't see is pretty bare. The couch and matching table is from the 1950's. 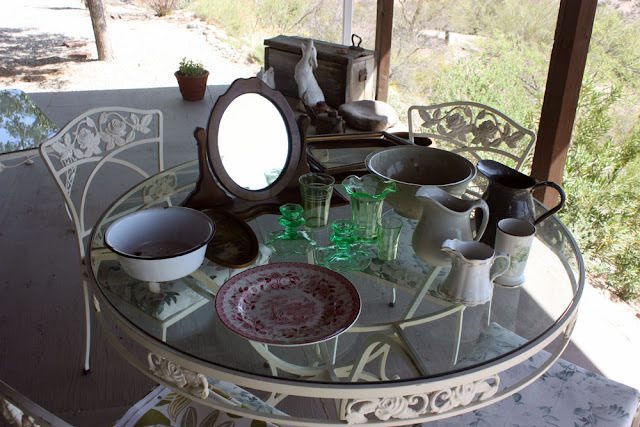 The table and chairs are from the 1960's. The vendor had the cushions recovered and was kind enough to give me enough fabric to recover the 4 chairs. 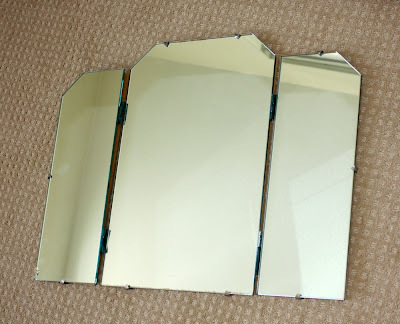 Another big score was this tri fold mirror, I held my breath after I asked the woman the price until she said $15! What!!!! 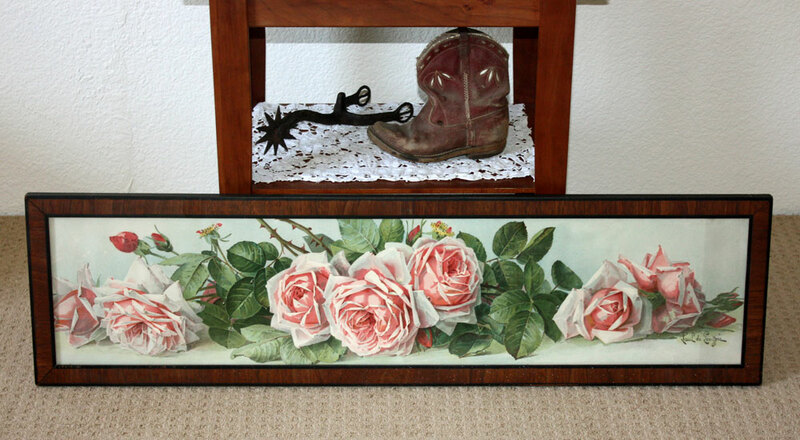 A little vintage shelf, I'd like to keep the living and dining rooms a little western/southwestern. I couldn't walk away from this old oil painting a few weeks ago of a calming lake with birch trees...$12! They both remind me of my Grandparents cabin on Bay Lake when I was a kid, I spent a lot of weekends there and have fond memories. 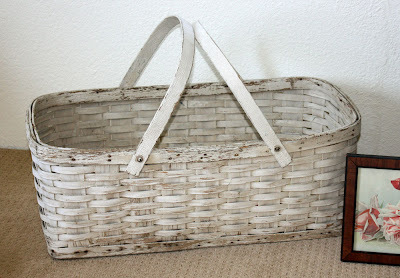 And lastly, this huge basket that I picked up at the very first flea market, not sure what but something will fill it eventually. 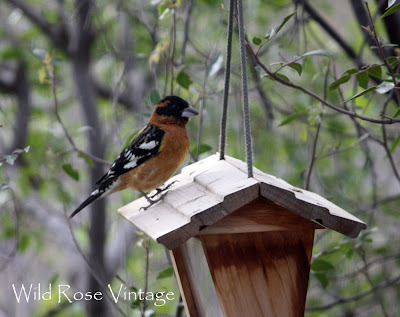 and new visitors keep showing up at the bird feeder, this is a Black Headed Grosbeak probably on his way north. Oh my....what beautiful treasures! I am in love with the rose print. You find the most amazing prints....I loved the lily of the valley one from another recent post too. 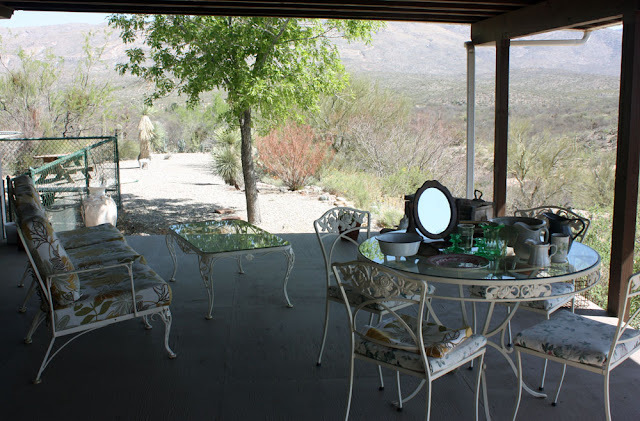 Everything you got is so nice and the patio furniture is too! Enjoy all your new treasures! WOW! what a bargain on your print! Great flea market finds! 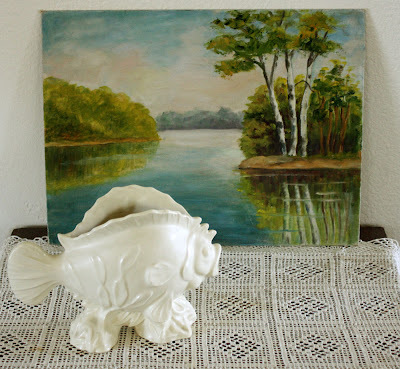 Love the oil painting and that white fish looks great with it. Wonderful finds! It's hard to pick a favourite but I really like the oil painting. Oh my gosh! You are like a flea market guru, Faye!!! I LOVE all of your treasures you've found! I came over to see what you've been up to, and am I impressed! 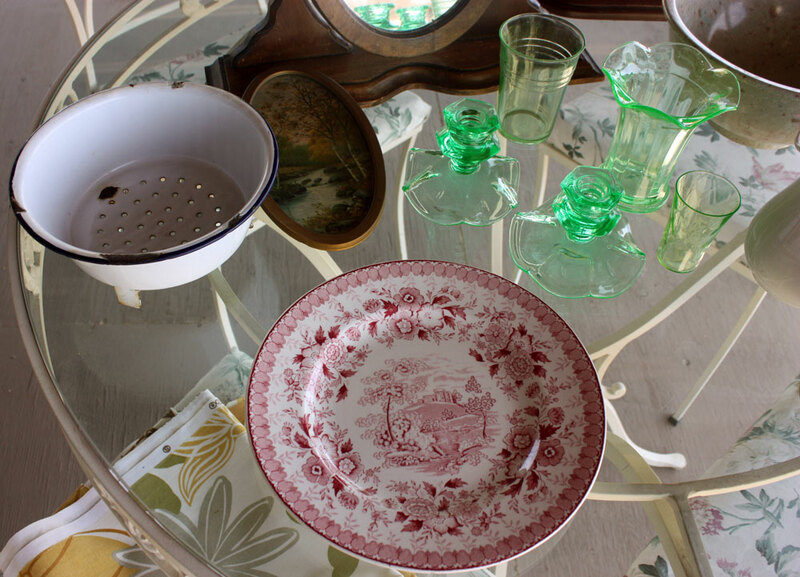 You really know how to put together vignettes, girl. I wish I lived close to you, because I think we would be great shopping buddies. Enjoy your new/old pieces, sweetie. Wow...love peeking at your little piece of heaven on earth Faye! Your new treasures are wonderful! Wow, you found some wonderful goodies...and great prices, too! The deLongpre print is amazing! The view off of your porch is gorgeous! Hello there, new follower. 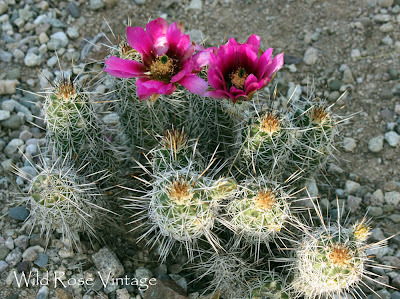 I am a fellow Arizonian, a native to be exact in Scottsdale. I had to chuckle when you said we get up at the crack of Dawn. My hubby is from Indiana and when we first met he asked, dont you ever sleep in, I said heck know it will be hot by 10am LOL. Wow, you sure DID get it right. I'm sure I've said it before, but I would have bought everything here. Sounds like this is one event you'll be going to every month. You really score. 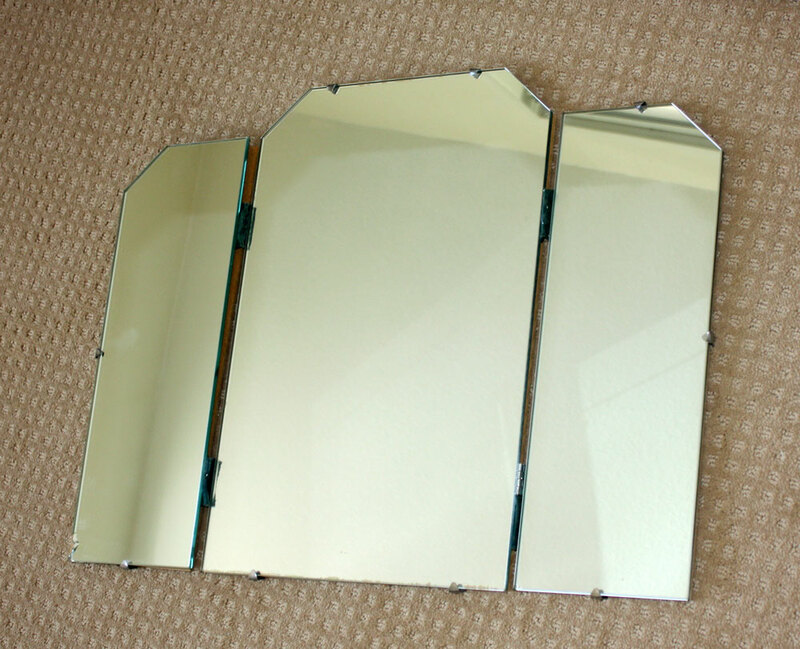 The tri-fold mirror is such an interesting design. I am pretty boring because my other favorite is the white picnic basket. Love all your beautiful pictures. I am originally from Iowa..now live in Fort Worth and have a son and dear friend in Tucson. Maybe next winter we can touch base..